Located just minutes from the front gates of the Disneyland Resort in Anaheim, California the Anaheim Majestic Garden Hotel is a sprawling family-friendly hotel. 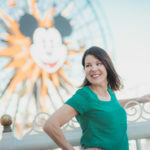 Our Day Trips TravelingMom recently visited Disneyland and stayed overnight with her family of five at the Anaheim Majestic Garden Hotel. 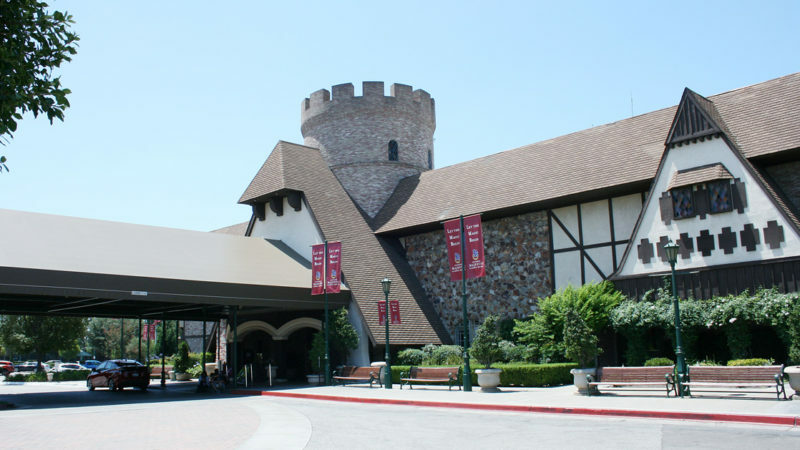 From the elegant castle-theming, peaceful garden atmosphere, complimentary shuttle and value pricing this hotel near Disneyland hit the mark in many ways. Two years ago my family of five first stayed at the Anaheim Majestic Garden Hotel. As Disneyland regulars, we’d seen this castle-themed hotel on Disneyland Drive for years (it’s been in existence since 1969). With 489 rooms, this 13-acre property has recently undergone a massive overhaul at the cost of $6 million dollars which resulted in beautiful newly remodeled spaces. 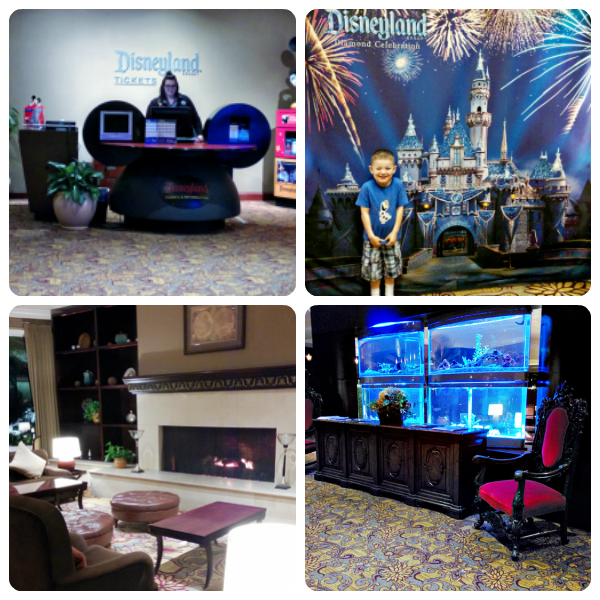 We’ve stayed at the Anaheim Majestic Garden three more times, and it’s quickly become our go-to hotel in the Anaheim area. This hotel near Disneyland also is in close proximity to other area attractions including Knott’s Berry Farm and the Discovery Cube OC. 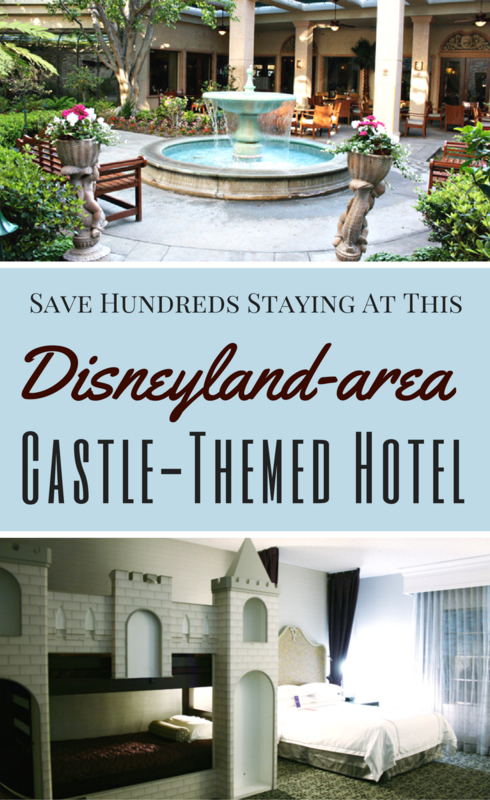 We usually choose a hotel near Disneyland within walking distance from the Park front gates. Though the Anaheim Majestic Garden Hotel is just a half-mile from the Disneyland Resort, it’s not in a very walkable location. 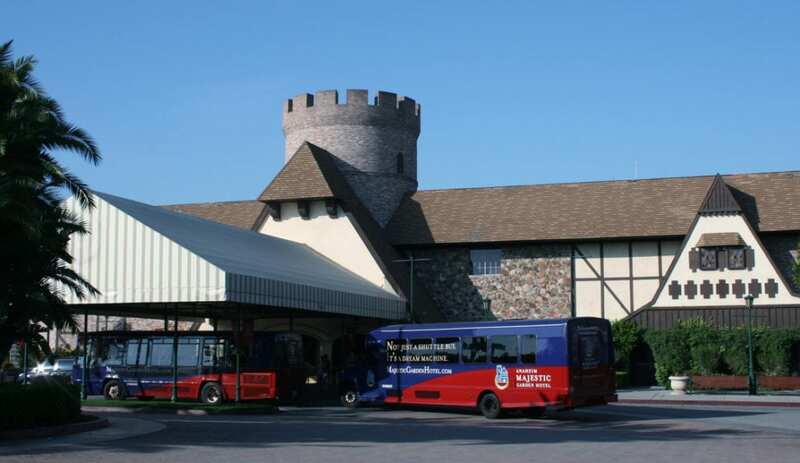 Fortunately, the hotel solves that by offering complimentary shuttle service to the Disneyland park entrance. This is a definite plus and saves money over having to park in a Disneyland lot. Close to the Disneyland Resort but not within walking distance. Guests will either have to take the shuttle or drive/park their own vehicle. The lobby really sets the tone of this hotel. It exudes a warmth and elegance that goes beyond the reasonable price of an overnight stay here. My kids enjoyed exploring the large detailed lobby. There’s a suit of armor, fish tank (they found Nemo!) and sitting area with fireplace. 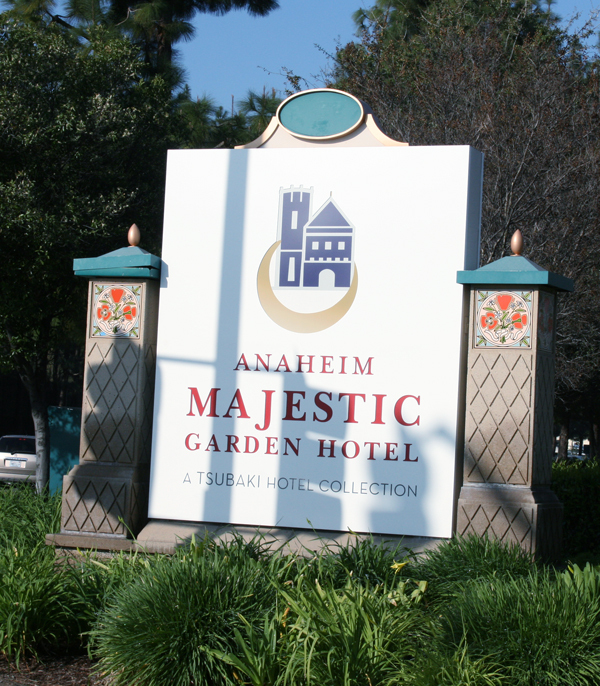 The Anaheim Majestic Garden Hotel is a Disneyland Good Neighbor Hotel. This offers guests the ability to purchase tickets in advance at the Disney Desk. Check-in is always fairly quick. Parking is usually not a problem. However, on my last visit, we didn’t arrive until nearly 1 am. I had to park in a red zone (as instructed by the front desk) because there weren’t any spots available. Self-parking is $16 per night. The Anaheim Majestic Garden Hotel parking lot has an attendant and secure lot (not many of the Anaheim hotels offer this). One of the highlights to staying at the Anaheim Majestic Garden Hotel is the free shuttle that delivers guests to the Disneyland Resort. Guests can pick up a ride on the Dream Machine Shuttle at the front entrance every 30 minutes. We haven’t had a chance to use this amenity, but I can see that this would be an advantage to staying at this location. Walking back to your hotel or even waiting in line to take the tram back to the Mickey and Friends Parking Area can be a drag, so grabbing this shuttle to deposit you back to your room would be wonderful. I’d venture that there might be additional wait times for the shuttle during Disneyland peak season. There were two Dream Machines in operation on the Saturday morning of our visit. The Anaheim Majestic Garden Hotel has their own princess at hand to take photos and tell stories. Princess Corinne greets guests during breakfast. She also hosts a fireside storytelling hour in the evening. Unfortunately, heavy traffic through Orange County prevented us from meeting Princess Corinne during the evening story time. Guests can read The Story of the Lair (how the hotel transformed into an “enchanted castle”) painted on the hallway walls and carpet. A Swimming Pool is a Must! Our hotel room overlooked the pool. At our 9 p.m. arrival, a few guests splashed in the pool, but we couldn’t hear them from inside our room, which was nice. What we could hear, however, were the fireworks going off at the nearby Disneyland Resort! Basic but clean and well-kept, the pool area features a relaxing hot tub. The pool bar is open during the summer months. Cabanas offered shaded places to rest but get there early in the day to grab one. Located this close to the Disneyland Resort has an upside (watching the fireworks from outside the park). And there’s a downside (very loud fireworks noise when trying to put little ones to bed). If we’d been poolside, we would have been able to watch the show. Our room was angled as such that we couldn’t see them from the window. 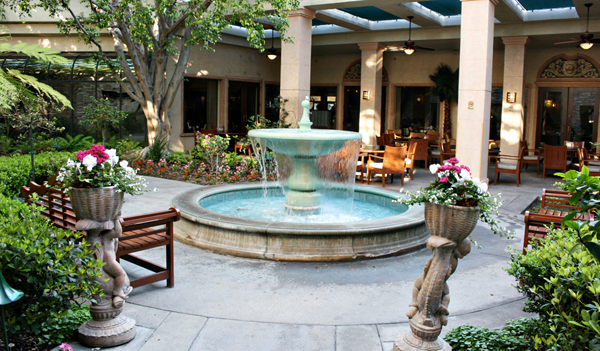 There are several dining locations at the Anaheim Majestic Garden Hotel. The California Deli offers deli items like sandwiches, salads, and fruit. The Garden Court Bistro has a breakfast buffet, light lunch options and ambitious dinner entrees including fresh seafood. Or relax with a drink in the Garden Court Bar & Lounge. The poolside bar is open during the summer months. The hotel also offers room service menu. A Japanese restaurant to be named Hanagi will be opening later in 2017. We dined at the Garden Court Bistro on our last visit. From sandwiches to entrees, the variety of selections is delightful. Dining in the afternoon on a Sunday, the restaurant was quiet and empty with quick and friendly service. Our waitress reported that this was generally a slow time period and that the restaurant can get very busy. We dined inside with the air conditioning. On a less warm day, consider the restaurant’s beautiful patio area. My son selected a loaded-with-pastrami Reuben sandwich, while I chose the refreshing Caesar salad, served with warm, freshly baked loaves of bread. My daughter dug into the large portion of fettuccine Alfredo with shrimp and mushrooms .which she couldn’t finish! We polished off the lunch with a brownie sundae big enough for 4 to share. 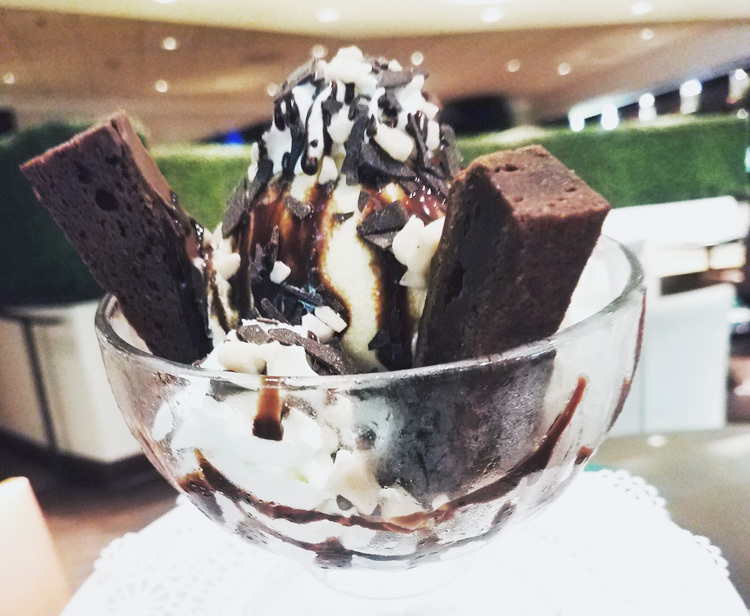 I’d highly suggest saving room for dessert – this sundae was delicious! Priced around $5.50, you’d be hard pressed to find such a large dessert inside the Disneyland Resort at such a reasonable price! 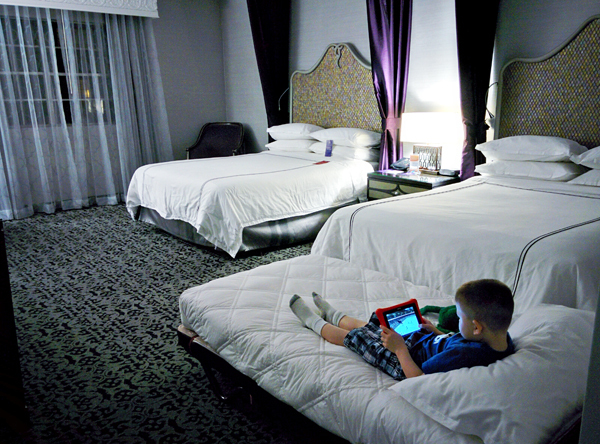 On our first two stays, my family of five was booked into a castle queen room. Easily one of the largest hotel rooms we’ve ever stayed in, the newly remodeled space was fresh, and the calming color scheme was restful and sophisticated. Renaissance-style draped the two queen beds with details on the headboards. A comfortable roll-away bed in the room accommodated our fifth guest (we requested this upon reservation). Even with the roll-away bed, we enjoyed a generous amount of space. The beds were extremely comfortable with down pillows and cozy comforters. I appreciated the separate area outside the bathroom with a large closet, full-sized mirror and bench seating. I sat here to apply my make-up in the morning. It was nice not take up precious bathroom space because the actual shower area was on the smaller side. 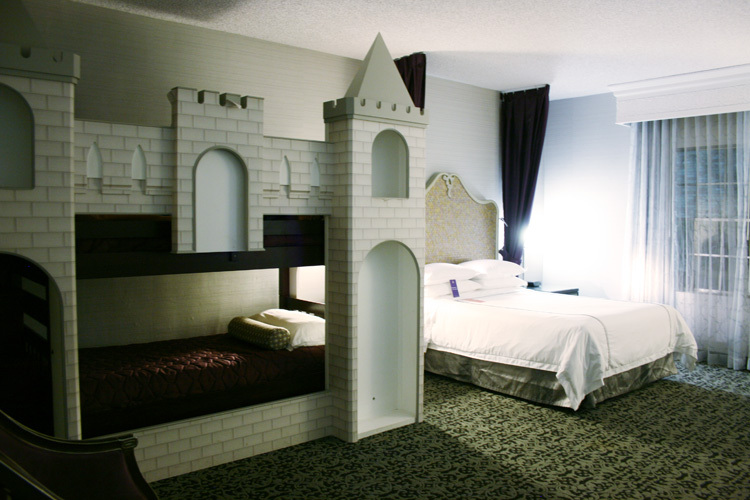 For our most recent visit, we stayed in a Castle bunk bed room. Naturally my 5-year old gasped when he saw this cool bunk bed. It looks straight out of a fairy tale! There was still lots of space to spread out even with this bed combo. My only complaint about the hotel is a smoking station set up with ashtrays right next to the front entrance. This is where guests pick up the Dream Machine Shuttle, near the loading/unloading area. It was unpleasant to have to walk through the smoke (at 35 weeks pregnant, no less). Unfortunately, there was no way to avoid this as the smoking area directly on the sidewalk to the entrance. I’d suggest moving this area to a less prominent spot where it’s not a hindrance to guests as they enter the hotel. 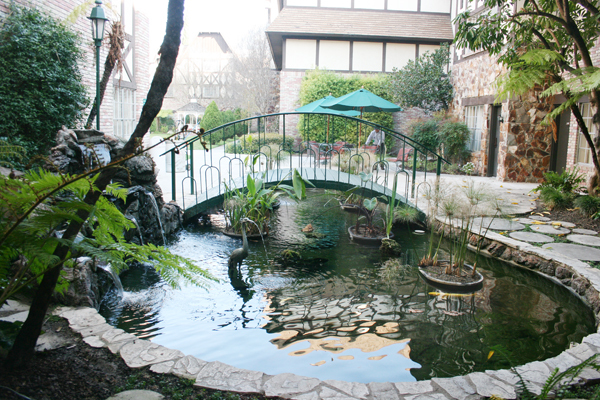 We’ve returned many times to the Anaheim Majestic Garden Hotel over the past few years. We really appreciate the large rooms and extra space that was provided for our large family. Cleanliness and a secure parking lot is another plus. The value of the Anaheim Majestic Garden Hotel is great. Compared to other Disneyland area hotels much is offered at the Anaheim Majestic Garden for very decent pricing. Take advantage of frequent specials offered for booking on their website. 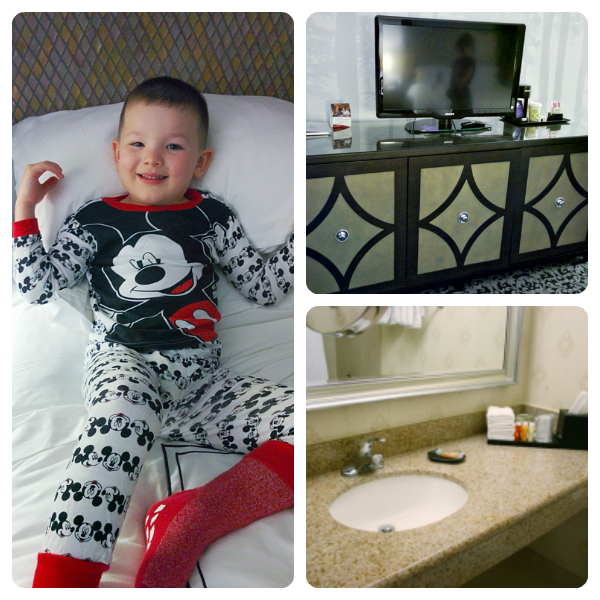 The Anaheim Majestic Garden Hotel was a very nice fit for our family. 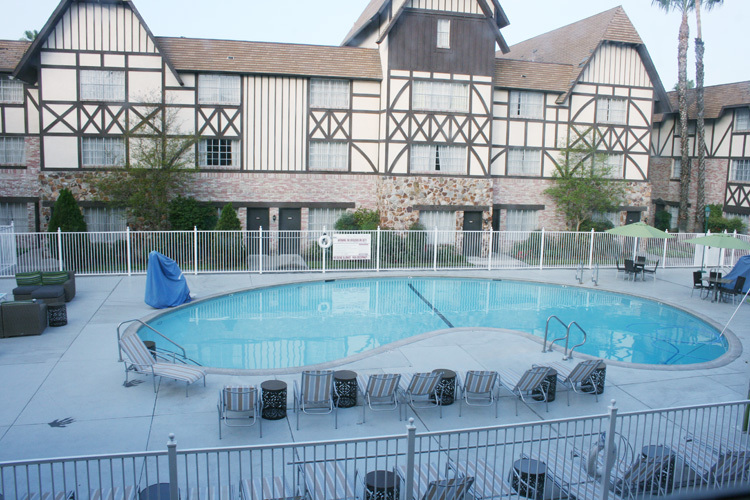 It’s really a wonderful hotel near Disneyland that works for anyone looking for off-site lodging.